Meris WordPress Theme - Free Responsive Business Theme. 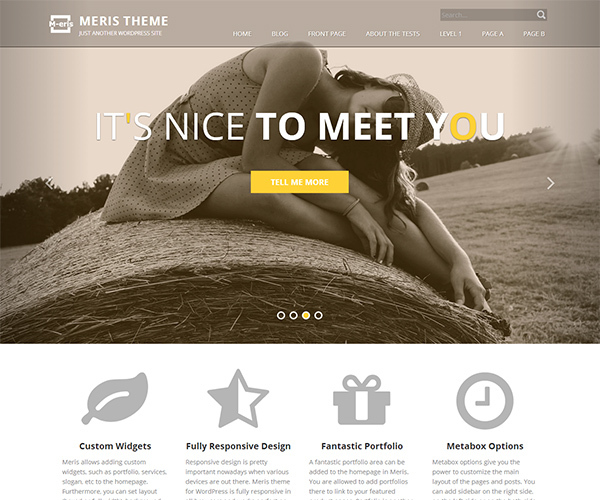 Meris WordPress Theme is a new free theme for WordPress. Following the trend of web design, Meris adopts responsive layout. This clean theme is developed using Bootstrap 3, which makes the theme works well with desktops, smartphones, and tablets. The dedicated design, awesome widgets, the full-screen sliders, portfolios, etc. give you the premium look and feel. Meris allows you to customize your site very easily. By adding widgets to the homepage, you can add various contents there, for example, slogan, portfolios, services and more. Post layout is also flexible, you can select right-sidebar, left-sidebar, or sidebar on the both sides. What needs to be mentioned is that, Meris theme supports sliders in the sidebar! 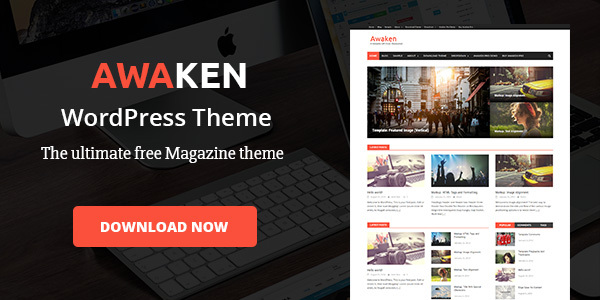 This is a perfect theme for business, travel, food, sports, portfolios and other niches. Furthermore, you can also try the pro version to get a better experience. Responsive design is pretty important nowadays when various devices are out there. Meris theme for WordPress is fully responsive in all browsers such as Google Chrome, Firefox, IE, etc. and works perfect on mobile devices incuding smartphones, tablet pcs, and so on. The layout can adapt to the screen size of different devices. Meris allows adding custom widgets to the homepage, which means, you can add different contents such as portfolio, services, slogan, etc. to the homepage. The lite version includes 4 custom widgets while the pro version includes 6. This feature can help you create a professional homepage within several simple steps instead of doing lots of complex coding works. Full screen slider is embedded in the homepage. The stunning sliders will make your most important content stand out. Compelling sliders can attract your visitors when they first come to your website. And here, Meris can help you make it true. A fantastic portfolio area can be added to the homepage in Meris. You are allowed to add portfolios there to link to your featured product pages. Portfolio is another important means to showcase your products in the homepage. Meris allows you to add portfolios as per your needs, one row, two rows or more are allowed. Different from the large sliders in the home page, the sliders in the sidebar can appear next to all your posts or pages(you can choose that). A small slider show can add large exposure to your features products or something else. Metabox options give you the power to customize the main layout of the pages and posts. You can add sidebar on the right side, on the left side or on the both side. In addition, you can set different sidebars: page left sidebar, page right sidebar, post left sidebar and post right sidebar. To make you website stylish, Meris gives you more power. Meris supports to changing global color via one simple click, the color picker helps you to find the color you prefer easily. Meris supports wide range of widgets and multiple social icons, such as Facebook, Twitter, Google+, YouTube and many more. You can add SNS links in the foot area of the whole site or the sidebar for the blog.